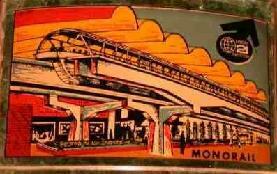 1962 Seattle World's Fair souvenir decal showing an artist's rendering of the proposed downtown Alweg monorail station. - Souvenir-Abziehbild von der Weltausstellung 1962 in Seattle, das eine Vorstudie zum Entwurf des Alweg-Bahnhofs im Stadtzentrum zeigt. - Collection/Sammlung Reinhard Krischer. Kim Pedersen's comprehensive monorail website ! The ultimate source for monorail information. Kim Pedersens umfassende Einschienenbahn-Webseite ! Die ultimative Quelle für Einschienenbahn-Informationen. Part of Bill Cotter's website "WORLD'S FAIR PHOTOS"
Wunderbare Webseite über Frankreichs Aérotrain. Wonderful website about the French Aérotrain. This website originally accompanied an exhibit on display at the Brown Gallery in the University of California-Berkeley Main Library (Summer 2004). Luckily this site remains available and wonderfully illustrates transportation plans, schemes and visions, - many of them from the same time that the Alweg monorail concept was successfully developed. It is noteworthy that the Alweg monorail is one of the few technical concepts illustrated on the above website that actually became reality ! Dr. Ralf Bülow und Michael Peters ! Verein Historische Strassenbahn Köln e.V. Die Metro-Systeme der Welt auf einer Webseite! The world's metro-systems on one website! Everything about the famous American Great Northern Railway! Alles über die berühmte amerikanische Great Northern Railway!